Clotted Cream for Afternoon Tea. Clotted Cream is a very British, thick cream that comes from the best Devon cows that is traditionally served on English scones for afternoon tea. Everyone has heard of the British afternoon tea, but not everyone has heard of clotted cream that is traditionally served. I’m going to tell you the history behind the afternoon tea and also about clotted cream for afternoon tea along with a recipe. Always served with scones and jam, clotted cream is a thick cream, like a marriage of butter and cream that takes quite a process to make, but well worth it because an afternoon tea is not complete without it. The tradition of afternoon tea started in the early 19th Century when the wealthy set felt they needed a ‘pick-me-up’ in the afternoon. This is not surprising because they typically ate just 2 meals a day; breakfast and dinner, so the skipping of that 3rd meal led to a mid afternoon slump hence the creation of afternoon tea. Traditionally, the upper classes would serve a ‘low’ or ‘afternoon’ tea around four o’clock. The middle and lower classes would have a more substantial ‘high’ tea later in the day, at five or six o’clock, in place of a late dinner. The ‘high’ and ‘low’ names were given for the height of the tables used at each tea. Weather permitting tea would be served in the garden. Once the typical grey skies loomed (we are talking about England here), the tea service would then be served indoors in the Drawing Room. The drawing room a room in the house where one could ‘withdraw’ to for privacy with their guests. Cream tea is afternoon tea served with scones and clotted cream. If you’re not have scones and cream, it’s just afternoon tea. What do they serve at a traditional afternoon tea? The selection of food ranged from savory to sweet. Starting, of course, with a pot of tea. Traditional Black English tea, Darjeeling (an aromatic floral tea from India) or Earl Grey (a blend of black teas scented with oil of bergamot) were typically served. 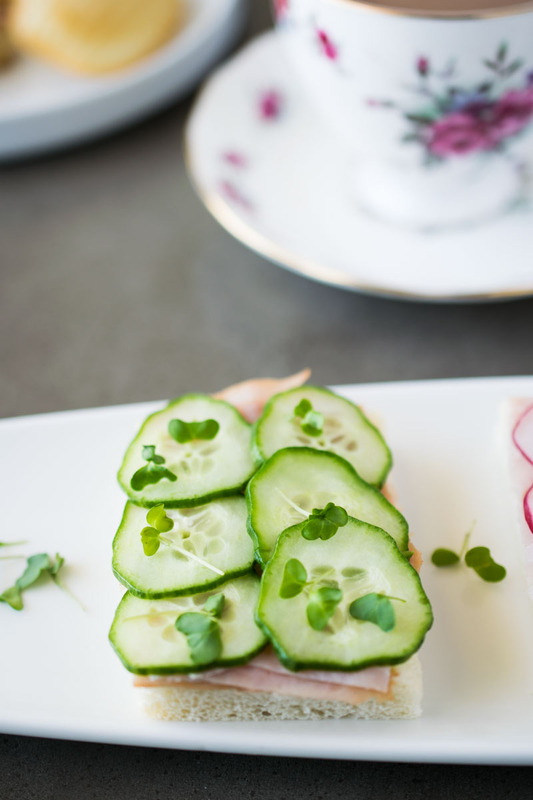 The savory portion consists of a selection of finger sandwiches, with dainty servings of each filling, of either cucumber, salmon, ham or egg salad and always with the crusts removed. The sweet selection came in the way of scones with clotted cream, strawberry jam and a selection of small cakes and pastries all beautifully presented on a tiered cake stand that was the centerpiece of the table. Below is a post all about a selection of afternoon tea sandwiches. This is one cucumber and ham. The appreciation of this tradition has grown immeasurably and a modern day revival can be enjoyed the world over with many upscale hotels and restaurants having adapted their own style by adding champagne to the menu. What is the difference between clotted cream and whipped cream? In addition to the butterfat content, clotted cream has a minimum of 55%, it’s the preparation of the cream that is the difference. Whipping cream is simply whisked until thickened. Clotted cream is cooked at a low temperature for hours until the cream clots and thickens on the top and that is what is used. Is clotted cream good for you? I would say, yes and no. Yes, in that you are consuming calcium, but no as I wouldn’t recommend eating it every day because of the fat content. If you’ve tried this Clotted Cream for Afternoon Tea or any other recipe on the blog then don’t forget to rate the recipe and let me know how it turned out in the comments below. I love to hear from my readers! Clotted cream is a very British, thick cream made from the best Devon cows that is traditionally served on English scones for afternoon tea. Place a large heatproof bowl over a large saucepan of water (make sure the water is not touching the bottom of the bowl. Add the cream to the bowl and bring the water to a simmer. Using a candy thermometer, bring the temperature of the cream to 180 degrees F (82 degrees C) and maintain that temperature for 1 hour. After 1 hour, turn off the heat and remove the bowl from the boiler. Allow to cool, then wrap the bowl with plastic wrap and refrigerate for 8-12 hours. Skim the clotted cream off the top and put into a container with a lid. Serve on a warm scone with strawberry jam. This worked out well for me. Made your scones too, served with blackberry jam and everything was so good. The cream I can get is ultra-pasteurized and I’ve heard that won’t work. Can you chime in please? Hi Bonny, this is correct, ultra is known not to work. If you are in the U.S., Whole Foods carries an organic pasteurized cream. Thank you so much for this! I haven’t tried it yet, but I will! I’ve been working at baking the perfect scone-plain and with a very short texture. But clotted cream is not sold everywhere here in the states! Thank you for sharing! I wonder if this could be made using a sous vide? The cream would be put in an airtight bag then immersed in water. The sous vide would keep the water at a constant 18o degrees. Thank you very much for your delightful and informative article. 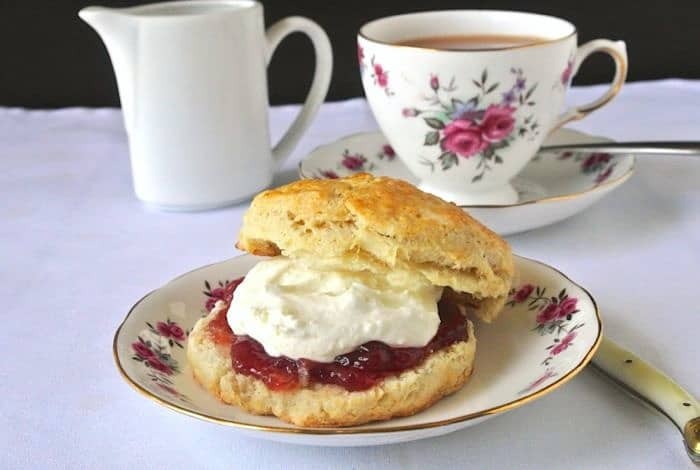 While I have not yet been able to travel to England (I will get there someday), I do appreciate the recipe for clotted cream and plan on making it for my next tea party. It will certainly make it more authentic and can hardly wait to one day experience a “real” English tea.! How interesting! I didn’t know the difference between “high” & “low” teas, and in fact would have guessed just the opposite! Am anxious to try making the clotted cream. Have heard of it and love scones but never had them served properly! Thank you for sharing!! Homemade clotted cream is time consuming, but definitely worth it until you can get over to England to try it. Thanks for stopping by. I, too, thank you for unraveling the mysteries of clotted cream. I often make my own butter, buttermilk, yogurt and bread, and am looking forward to adding this to my culinary achievements! What do you do with the rest of the cream after the clotted parts have been skimmed off? Can it be used for anything else or is it just thrown away? I just use it like you would milk. You can add it to your coffee or use it when baking in place of milk. I hope this helps and thanks for stopping by. I never knew how clotted cream was made. Thanks so much! Bless you. I am so looking forward to making this clotted cream. I had a Scottish grandmother and an English grandmother. I miss theses lovely ladies and their tea so much Blessings too all of them and you! Aww, this is so sweet. Thank you Dotti. Can you freeze the clotted cream? I’m going to try your recipe tomorrow! Fingers crossed! I just made the scones today. After my trip to Scotland and England last month I can’t get enough of a creamy tea! 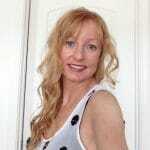 Hi Kristine, I have not tried freezing but after research it looks like it should be fine. Thanks for the recipe for clotted cream. Love that stuff! I was born in Exeter, England, and my aunt always woke us up with tea and biscuits. Never forgot that ritual. Since living in the USA I’ve gone to tea rooms here, but they’re not the same as the tea rooms in Exeter. By the way, I really like your name (Janette). Could you tell me what quantity of clotted cream you get with those 16oz of heavy cream please? Hi Marie, the amount of clotted cream yielded varies each time I make it, depending on how much of it clots. When I did this post, I got 2 of the jars in the picture full. They are 3/4 cup (6 ounces) for a total of 1 1/2 cups (12 ounces). I hope this helps, thanks so much. Do you do anything with the leftover liquid? Have you ever attempted this process by setting up the same double boiler in an oven set to 180? Hi Sarah, I have seen this method but never tried it. I plan to one day. Thank you for stopping by. Hi, can I make this with whipped cream? Hi Sara, you can’t make it with whipped cream, you have to start with the cream in it’s liquid form. You can use whipped cream in it’s place (for topping scones) instead of going making the recipe but it is slightly different. The whipped is light and the clotted cream is thick and creamier. But I hope this helps. If your double boiler is stainless steel, it should be fine. I would avoid aluminum at all costs. How long is this good if you want to make it ahead? Hi Kathy, I would say use it within 10 days of making it. When making, there is a film that develops on the top of the cream while it’s on the stove. Should I mix a little bit or leave the film? Thank you Beks. I hope you like it. I enjoyed the explanation of afternoon tea. I loved the pumpkin scones with the apple whipped cream. I will also give the clotted cream a try. I have not been pleased with any that I have ordered in a jar, sure the homemade will be better. I wondered if you had the recipe for the cakes you show in the picture of the tiered cake stand holding cakes for tea. The one topped with caramel looks divine. Hi Helen, thank you so much and I hope you like the clotted cream. Those cakes do look delicious, but I don’t have the recipes for them, sorry. 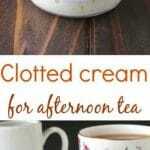 Must have some afternoon tea and this clotted cream recipe this afternoon. I’ve never given the ‘high’ and ‘low’ aspect of afternoon tea a thought before, so thanks for explaining that! Fresh scones are my favourite afternoon tea ‘essentials’! It seems so logical, doesn’t it? Thank you Helen. Thanks for sharing Janette, I did not know the history of afternoon tea! I wish I was able to skip the their meal 🙂 Will check the clotted cream recipe, too. 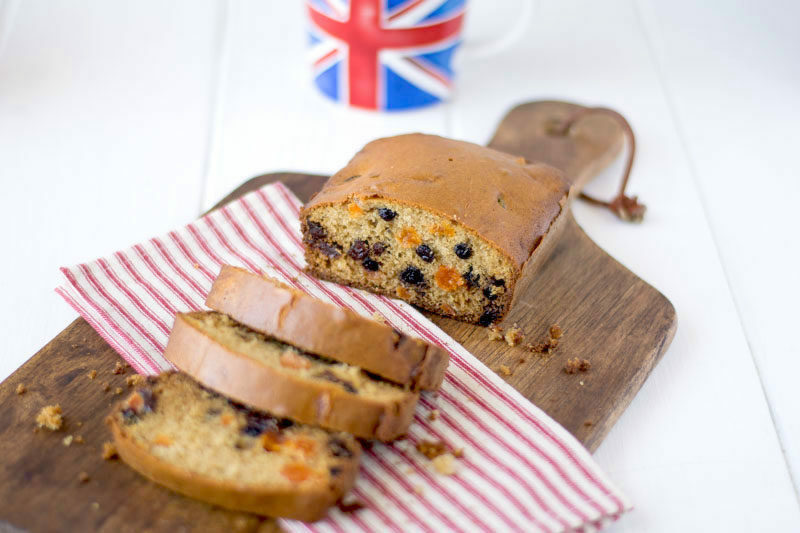 I never knew the history of Afternoon Tea – thank you so much for sharing! I have only had clotted cream a few times (when having tea at a nice hotel while traveling), but it was such a wonderful experience and so incredibly delicious! Thank you so much Kathleen. I also left a comment on the site Janette. This was delightful to read.